Let me tell you about my friend, Dewayna… I call her “Tay”… I have since we were about ten years old. I still do. We went to the same church together – First Baptist Church of Red Oak in East Point, Georgia. She went to Woodward Academy – a really ritzy private school in the Atlanta area. I went to a plain old boring public school. She lived in a three level house that seemed like a mansion to me. I lived in a tiny little ranch house with four bedrooms, only one bathroom and too many people. She had one very grown sister who had a kid already… a teenage sister who thought she was grown and her. I had a big brother just 22 months older than me and … from the time that she and I met until I was in high school, there was a new baby brother who came every couple of years. Once… I had to pick between her and Doreen Kemp for my bunkmate in church camp. Never one to like change, I picked Doreen… who had been my bunkmate the year before… leaving Tay with Betty Brannon who was a nice enough girl but just not, well, me. I think she’s forgiven me. Maybe. I thought Tay had the coolest clothes… the most amazing Barbie accessories… the biggest record collection… I saw my first microwave at her house. My first VCR - we watched Urban Cowboy over and over because it was the only videotape they had. My first big screen tv - you know, the old kind with the upside down tv and the mirror. She thought my little house was cozy and thought it was cool that we made our own ice… hung our clothes on the line… and had all those babies. I didn’t think ANY of those things were cool. She had cable with all the movie channels and enough tvs in the house that you could stay up late and watch Saturday Night Live and get away with it. We had one, stinking black and white tv in the middle of the living room and there was no getting away with watching anything, if we’d had cable to be able to see anything worth watching. Her mama drove a big van and her parents had a motor home. They had a lake house and then when we were a little older (just at the right age for us to really enjoy it) they bought a condo on the beach in Panama City. My mama didn’t drive. We had an “older than dirt” volkswagon station wagon and just the one little house. They had this old blind white dog named Pax and a couple of cute little dogs you could take with you everywhere you went. We just had yard dogs. Her parents had season tickets to the Atlanta Falcon games and so I would go home with Tay after church on Sundays and keep her company while her parents were gone to the football game. Her sister was supposed to be watching us but usually was too busy making out with her boyfriend to care what we were doing. It was through her parents love for the Falcons that I learned everything I needed to know about football… four tries to go ten yards and if you can’t, the other team gets four tries. It’s served me well, this knowledge. We fell in love with Shaun Cassidy together. And then Rex Smith (remember him?). And then Scott Baio, although I think she liked Leif Garrett better. We once got her daddy steaming mad by telling him we were watching the Muppets on tv… and he thought it was the Chippendales… and once we realized his mistake, led him to continue thinking that way. I learned to waterski at her lake house… and had my first case of swimmers ear that same weekend. We once got stuck in traffic coming home from the lake one holiday weekend… and consumed enormous quantities of leftover bbq ribs. We once made – and ate – an entire batch of “pudding in a cloud”. We were given to excess then… and obviously… still are. She was my maid of honor at my first wedding. I called her up and said, “I’m getting married… wear something pink” and she followed my orders. And loaned me her mama’s pearls for my something borrowed. And showed up tan and looking fabulous… I was ten weeks pregnant and pale… but if anyone could look better than me on my wedding day and me not mind, it was her. I missed her wedding… we had been out of touch… I still regret it. Her parents worked for American Fitness Center so we always had towels and tshirts and shorts and whatever else you can think of emblazoned with their logo. We used to try to dress alike when we went places… to Six Flags or skating or whatever. We always made up outlandish tales to tell people… we were sisters… or whatever else we could think of. She got her drivers license long before I had the guts to… her parents kept this big old van down at the condo and we would drive it up and down the strip. I’m not sure it was a great idea turning two 17 year old girls loose in a van… but… there we were. She knows more about me than I remember about myself. She’s stuck by me through two failed marriages (for me) and one failed marriage (for her). 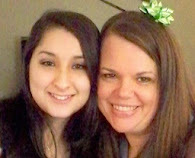 She’s a single mom too… and we compare notes on how badly our teenagers treat us. I’ll never forget the phone call I got from her… it went something like, “we’re too young to be having this conversation”… and she followed that by telling me that her daddy… who I shared a birthday with… and called “Big Daddy”… and loved like he was my own daddy… had died. My heart broke… it breaks now in remembering this. Our lives were so different but we fit - just like the city mouse and the country mouse. We completed each other. She is the sister that God forgot to give me… and today is her birthday…and other than my natural born siblings, I’ve shared more birthdays with her than anyone else in my life and I just wanted to tell you a few of the reasons she’s so special to me. Happy Birthday Tay… may the good Lord see fit to let us share another 43 years together… Oops. Did I just tell your age? That was an incredibly sweet tribute to Tay! I am sure she will love it and hope she has a great birthday! beautiful tribute to such a good friend! did I mention that I like your new face book pic..? I remember Rex in the 'Pirates of Penzance' too, ya know! And I thought Leif Garrett was cool but when Charles got to be 'in charge' that Scott Baio was cooler! I am glad that you have such a friend and hey, I am 43... so if you are old then that makes me... chopped liver, cause I ain't old yet..!! where did the last 48 hours go?